Born 21 March, 1417, on the Flüeli, a fertile plateau near Sachseln, Canton Obwalden, Switzerland; died 21 March, 1487, as a recluse in a neighboring ravine, called Ranft. He was the oldest son of pious, well-to-do peasants and from his earliest youth was fond of prayer, practiced mortification, and conscientiously performed the labor of a peasant boy. At the age of 21 he entered the army and took part in the battle of Ragaz in 1446. Probably he fought in the battles near the Etzel in 1439, near Baar in the Canton of Zug in 1443, and assisted in the capture of Zürich in 1444. He took up arms again in the so-called Thurgau war against Archduke Sigismund of Austria in 1460. It was due to his influence that the Dominican Convent St. Katharinental, whither many Austrians had fled after the capture of Diessenhofen, was not destroyed by the Swiss confederates. Heeding the advice of his parents he married, about the age of twenty-five, a pious girl from Sachseln, named Dorothy Wyssling, who bore him five sons and five daughters. 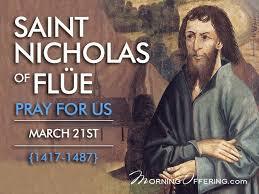 His youngest son, Nicholas, born in 1467, became a priest and a doctor of theology. Though averse to worldly dignities, he was elected cantonal councillor and judge. The fact that in 1462 he was one of five arbiters appointed to settle a dispute between the parish of Stans and the monastery of Engelberg, shows the esteem in which he was held. After living about twenty-five years in wedlock he listened to an inspiration of God and with the consent of his wife left his family on 16 October, 1467, to live as a hermit. 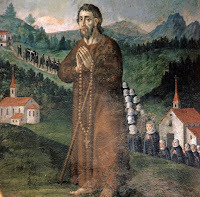 At first he intended to go to a foreign country, but when he came into the neighborhood of Basle, a divine inspiration ordered him to take up his abode in the Ranft, a valley along the Melcha, about an hour's walk from Sachseln. Here, known as "Brother Klaus", he abode over twenty years, without taking any bodily food or drink, as was established through a careful investigation, made by the civil as well as the ecclesiastical authorities of his times. He wore neither shoes nor cap, and even in winter was clad merely in a hermit's gown. In 1468 he saved the town of Sarnen from a conflagration by his prayers and the sign of the cross. God also favored him with numerous visions and the gift of prophecy. Distinguished persons from nearly every country of Europe came to him for counsel in matters of the utmost importance. At first he lived in a narrow hut, which he himself had built with branches and leaves, and came daily to Mass either at Sachseln or at Kerns. Early in 1469 the civil authorities built a cell and a chapel for him, and on 29 April of the same year the chapel was dedicated by the vicar-general of Constance, Thomas, Bishop of Ascalon. In 1479 a chaplain was put in charge of the chapel, and thenceforth Nicholas always remained in the Ranft. When in 1480 delegates of the Swiss confederates assembled at Stans to settle their differences, and civil war seemed inevitable, Henry Imgrund, the pastor of Stans, hastened to Nicholas, begging him to prevent the shedding of blood. The priest returned to the delegates with the hermit's counsels and propositions, and civil war was averted. Nicholas was beatified by Pope Clement IX in 1669. Numerous pilgrims visit the chapel near the church of Sachseln, where his relics are preserved. His feast is celebrated on 21 March. PRAYER OF ST. NICHOLAS OF FLUE My Lord and my God, take everything from me that keeps me from You. My Lord and my God, give everything to me that brings me near to You. My Lord and my God, take me away from myself and give me completely to You. Amen.